Russia and China are boosting bilateral cooperation on nuclear weapons strategies as they accused the United States of disrupting non-proliferation measures during a high-level meeting of the top five nuclear powers. Representatives of the so-called “Nuclear Five” met Wednesday in Beijing, at a time of heightened tensions between the Eastern and Western permanent members of the United Nations Security Council. The grouping included China, France, Russia, the United Kingdom and the U.S., signatories of the Treaty on the Non-Proliferation of Nuclear Weapons (NPT), a landmark document that sought to curb the spread of weapons of mass destruction during a decades-long arms race between Washington and Moscow. The U.S. has accused Russia of violating the 1987 Intermediate-range Nuclear Forces (INF) treaty, which established a mutual ban on ground-launched nuclear and conventional missiles within the ranges of around 310 and 3,420 miles. Washington argues that Russia’s new Novator 9M729 missile violates the treaty, while Moscow claims that the extensive U.S. missile shield in Europe could be used offensively as well, effectively breaching the deal. In opening testimony at a groundwater discharge permit hearing Wednesday, attorneys for a Los Alamos National Laboratory contractor said spraying the ground with water with remediated levels of chromium and RDX is environmentally safe. Chromium and RDX are known carcinogens. The chemicals are from contamination plumes found on the grounds of the laboratory in the 2000s. There’s no such thing as a perfect nuclear arms deal. Trump doesn’t get that. We have them to reduce the chances of catastrophe. Derek Johnson is the executive director of Global Zero, the international movement for a world without nuclear weapons. (CNN) President Donald Trump announced during a campaign stop in Nevada that he would terminate the Intermediate-Range Nuclear Forces Treaty, which was used to eliminate an entire category of nuclear weapons. This was probably the first time most folks had ever heard of this Reagan-era arms control agreement that helped end the Cold War and kept Europe stable for a generation. Which may explain why the American public is not yet reacting to this disaster with the level of panic it deserves. It’s tempting to think of treaties as little scraps of paper collecting dust on a historian’s bookshelf. Interesting, if you’re into that sort of thing, but largely irrelevant. The INF Treaty is something else entirely: This scrap of paper is a powerful leash, one of the few things restraining Russia and the United States (which together hold around 92% of the world’s nuclear weapons) from arms-racing us all into oblivion. 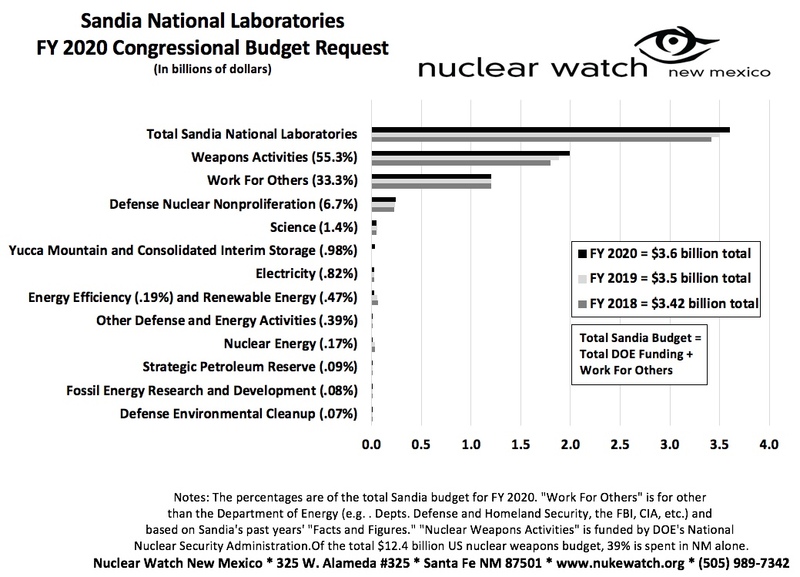 Today, Nuclear Watch New Mexico, Savannah River Site Watch, and Tri-Valley CAREs sent a letter of demand to the U.S. Department of Energy’s National Nuclear Security Administration (NNSA) to inform the government that its plan to quadruple the production rate of plutonium bomb cores is out of compliance with the National Environmental Policy Act (NEPA). 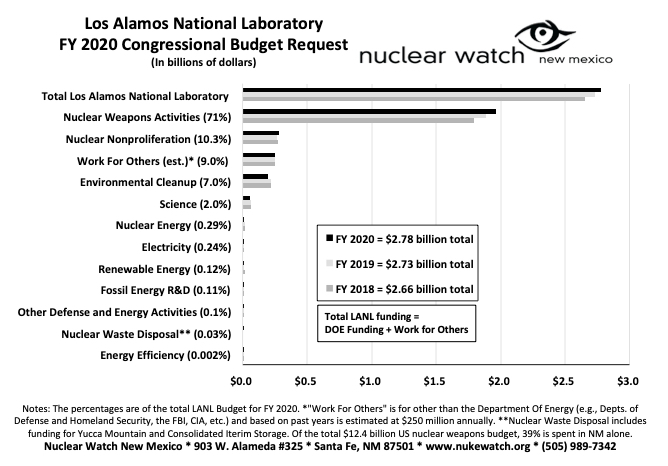 A representative of Triad National Security LLC, which takes over management of Los Alamos National Laboratory in November, said Wednesday the consortium will pay gross receipts taxes, easing concerns of local officials about losing millions of dollars in revenue. Los Alamos County officials had said previously that if Triad were deemed to have nonprofit status, the county estimated it could lose $21 million annually and the state $23 million in gross receipts tax revenues, according to published reports. Read More in the SF New Mexican here. “The United States can deter any country from using nuclear weapons against America and its treaty allies with a nuclear force that is far smaller, less destabilizing, and less expensive than the one the Pentagon is planning to build. Bad Idea. Don’t Do It. “Let me be crystal clear: There is no such thing as ‘limited use’ nuclear weapons, and for a Pentagon advisory board to promote their development is absolutely unacceptable. This is even more problematic given President Trump’s comments in support of a nuclear arms race.